Uxbridge UB Residential & Industrial Window Cleaners | Quality Property Care Ltd.
Meet the revolutionary residential and commercial specialized window cleaning! 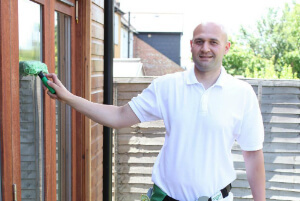 Discover how simple it is to get your windows sparky clean. Get some sleep, while the experienced and well-trained window cleaners show their finest in your property. Contact us on 020 3746 4287 to receive more specific info about our top rated and hassle-free services. Using special inside window cleaning equipment and kits we are able to get every last dirt spec from the inside of your windows, from the sills, to the frame, the insulation, the window, knobs and even the blinds. We will not do maintenance on said windows, simply cleaning until spotless. All liquids used by Quality Property Care Ltd. professionals are suited for the appropriate cleaning of your windows, with high dirt accumulation prevention effects, and no sill or window damage. To thoroughly clean inside, we use a bucket, a sponge, a squeegee, some pure water and a lot of practical experience. This service is not hourly based, meaning that you book us per window, we leave once you are satisfied. Maintenance on all of the windows to be cleaned have to be completed in order for us to properly clean the seals, glass and frames. A minimum callout fee of 35GBP does apply, however, if you book us in advance you will get a lower cost. You can contact us for a same-day cleaning, during bank holidays and weekends at no extra charge. For us to be able to clean properly there must be a clear access to the windows and a parking place within 30 meters on the same side of the property as the glass windows. We are unable to clean wooden window frames and sills with our water-fed system, or we might harm the glass and paint. We work for shops, offices, residential homes, restaurants, tenants, landlords, property managers, public buildings, libraries and a range of other customers. We are also delivering you an interior window cleaning job which can be combine arranged with the exterior window cleaning service. At a lower price tag you can book both and find your home or office windows cleaned along with your windows, gutters and conservatory roof To properly clean inside we use a professional grade squeegee, protective gloves, a ladder, a bucket and a special detergent mixture. The detergent is applied then left to react with any dusty or greasy stains on the inside of the window. After that it is scraped away with the squeegee leaving your windows spotless. To achieve our famous final results we use a simple water-purification method which strips away normal tap water from its minerals. This simply leaves it a simple H2O molecule which is a lot lighter and sticks a lot more to mud, dirt and grime. The method is a very effective way of cleaning away even the dirtiest of window surfaces and can reach up to 4 stories in height. Working with a telescopic water-fed pole we clean the windows and window sills from the top to bottom using only water, no detergents as detergent bring in even more dirt if not rinsed with water. Furthermore detergents may have corrosive properties on PVC areas and cause the gasket and seals of the windows to rot and decay faster. The size of the water fed pole allows us to clean business buildings without having to use a ropes or ladder. Rope systems are offered for commercial clients, get in touch with us at 020 3746 4287 for more information. There is no better approach to clean up windows in London than to contact Quality Property Care Ltd. in Uxbridge UB, we arrive completely prepared, capable of reaching up to 4 stories in height. There are some service requirements that need to be completed in order for us to accurately clean. The window must be in a good condition, maintenance must have been handed before we can clean. A parking spot near the location of the cleaning, no further than 30 yards if possible and a clean reach of the window without any obstructions, like walls or branches. Feel free to reserve our budget-friendly and green window cleaning support right now! We are out there on 020 3746 4287! Get a cost-free quote now or use the direct online booking form for instant booking!